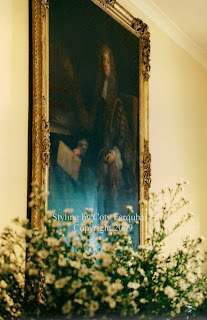 I am asked often by many people, what is it like to be a stylist? Well, it is hard work and your always on a deadline, but it is a wonderful job, or, should I say a wonderful way of life. 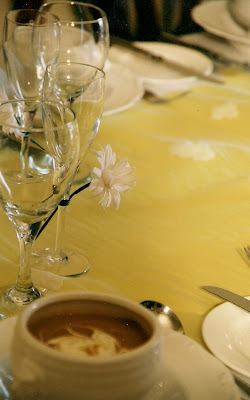 This tablesetting for a soft yellow themed wedding was for an advertising campaign and it shows a typical day in my styling life. 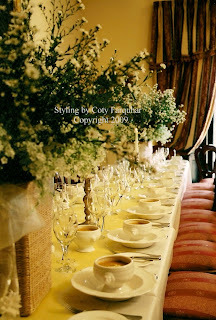 As a photographic stylist I create many weddings, real weddings for clients and friends and sometimes I do fake weddings. 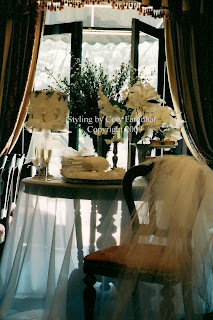 A fake wedding is a specially styled scene that I have set up on a location for a magazine or a client in the wedding & event industry. 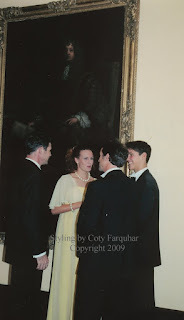 I think I have done more fake weddings in the last ten years than real. 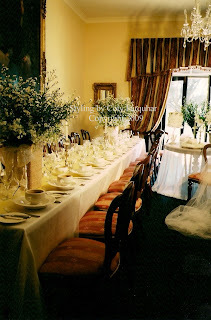 This wedding is one of my fake weddings that I did a couple of years ago, and I really wish there was a real bride nearby this day to use it as the room was so beautiful and it took me hours to set up and photograph it. I am commissioned by many wedding companies to style their new looks for the new season and their advertising campaign's. This was going to be a very busy day, still life shots all morning and models in the afternoon, all timed and set and the weather was on my side. To design the style of the setting I usually get a little of my inspiration from the room or the location the rest just comes from within. I knew I wanted a glamorous style setting with a friendly but formal feel. My colours, the softest yellows with white. 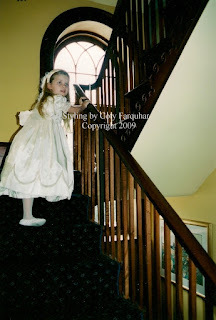 I found a perfect pale yellow vintage gown for one of the models to wear and the flower girls dress was white organza with touches of yellow flowers. The furniture often directs the mood as well. This room was quite dark so I knew I needed to lighten it up. 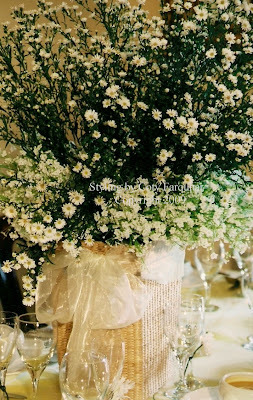 I used a roll of fabulous wallpaper down the centre of the table and then I covered the table with little white flowers then I put a long roll of white organza over the top before setting the table with white china and baskets of Easter Daisy, which I love!! 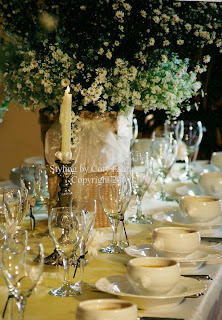 The organza fabric softened the look of both the tables in the room. 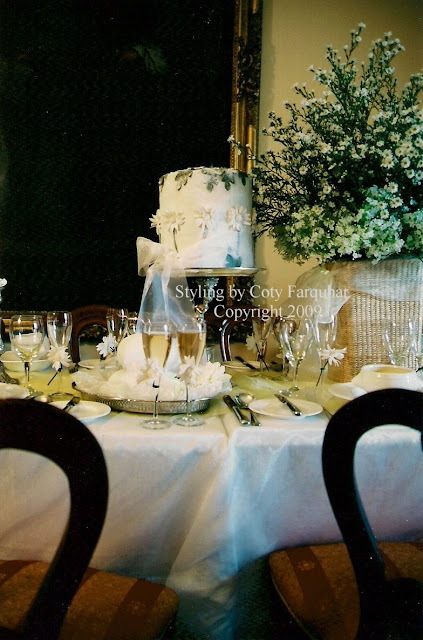 I placed the cake table at the open doors so that you could see the shape of the table through the organza. 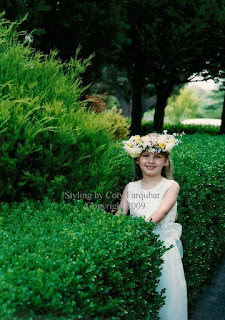 My bride and the little flower girl and four other models arrived in the afternoon for my bridal shots. 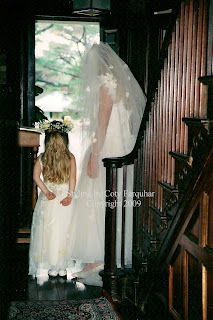 I worked on the bridal gown the night before sewing lots of little white daisy flowers to the tulle skirt and the veil. 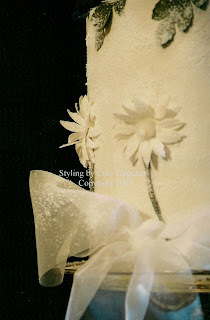 The wedding cake I had especially made for the shoot, it is real icing, but the cake is made of polystyrene and Andrew (my husband) shaped it for me with his wood working tools. 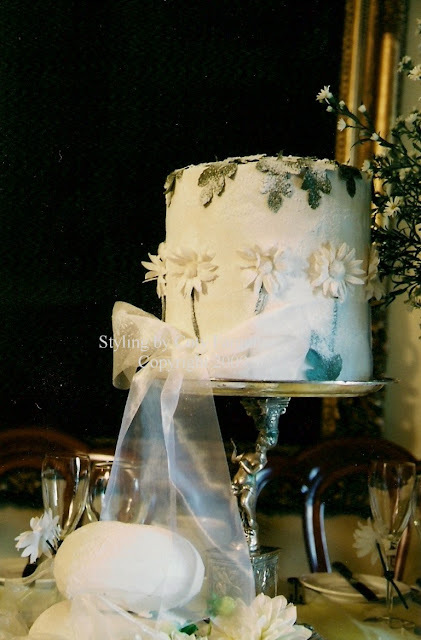 I glued the little white flowers around the outside and the leaves on the top and then I sugar dusted the whole cake including the ribbon. I need to start really early in the morning when I am setting up a large scene, my van is usually full to brim and packed with props and everything that I need the day before as I cannot forget anything as once I start styling and shooting there is no time to go and fetch anything. 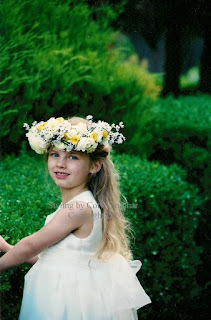 I had six models booked for this job as well and with the gowns and black tie outfits for the boys and a dress for the flower girl with all the accessories needed I had a lot of gear. It takes ages just to bring in all my boxes and gear and all the camera equipment, ladder and lights and an ironing board. This is the bit when I become a bloody furniture removalist., excuse the french. This particular room was really dark so I had to use flash lights everywhere. 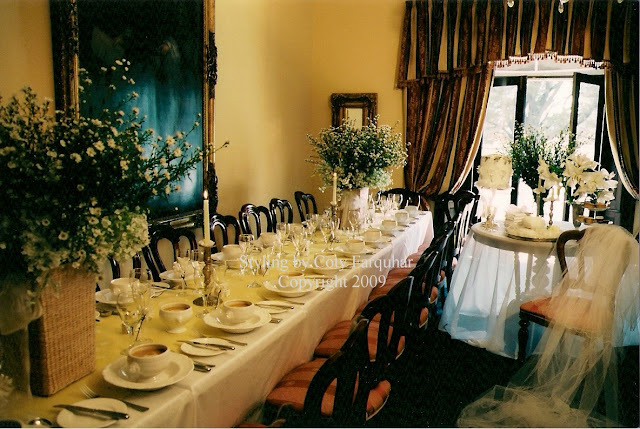 The room needed to also be re-arranged firstly before setting up the bridal table as it is normally set up as a restaurant. The glasses needed cleaning, the plates in order, the food on the table and then once everything was in position I started shooting. I run back and forth from the camera to the table and the table to camera for quite a while till everything is exactly where I want it. 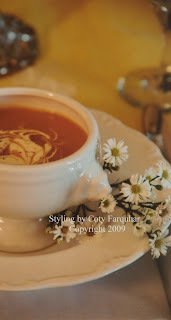 The pumpkin soup was delicious and it was made especially for the shoot, with a little swirl of sour cream on top, again designed and planned especially to match the whole look. 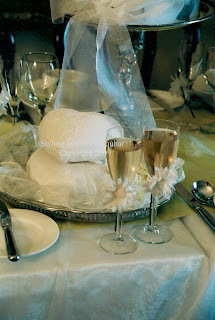 I twisted onto each champagne flute a little fabric daisy flower, so easy to do and just another way to have flowers on the table. 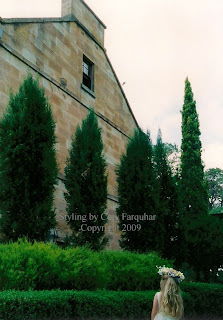 On this particular day there were so many people arriving to have lunch in the courtyard of this restaurant and all wanting to stop and have a look at what I was doing and have a quick chat, which was very frustrating as I was loosing time. This always happens when I work in public places, especially when there are beautiful models or something different happening. After I finished photographing the table setting my friend Rachel and all the other models arrived, so I moved from the still life section of table settings to wardrobe, hair and makeup. Once Rachel and the little flower girl and the others were ready I took them all down stairs to take more mood wedding shots around the building and garden before the sun set. Then finally after I got all the photographs that I needed, I then had to pack everything up including bridal gear and all the the table settings and my camera equipment. Squash it back into my van, rearrange the room back to the way it was, bid farewell to my client and head back over the hill to my home, where I then had to unpack everything (especially my cameras) from the van. Then I flop.... kick off my shoes and have a glass of wine or two and hope that there is something left in the oven for me for dinner. It is very exhausting and physical work when your both the stylist/art director and the photographer, I couldn't do it every day, but I love what I do and it is worth all the pain in the end when you get your film back from the lab, or should I say now download all the digital shots onto the computer. 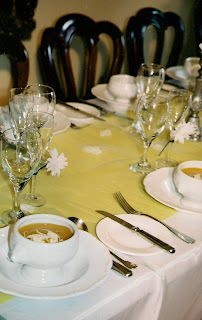 Thank you for visiting me and my blog and don't forget that it is Susan's Tablescape Thursday party at Between Naps on the Porch today, I'm off to visit some creative friends to see what their up to this week, come along too..
and your weather looks divine! wow...what a dream job. your styling is just breath taking and the love for your job shows right down to the finest details! spectacular!! How utterly spectacular!!! Thank you so much for showing us this beautiful event. You do wonderful work!! your work is fantastic!!!! all of the pictures are so stunning. Lots of beautiful things to look at on your page. Stunning! Every detail is perfect. I'll have to spend an afternoon looking at your blog. Thank you so much for sharing. Hi Coty! Oh, how wonderful! You are just amazing! Everything you've done and photographed is stunning! Thank you for sharing your gift with us. Coty, you are a well-rounded stylist! Capable of all of that and amazing photos to boot! Great post! You are so talented...I can not imagine the work this would take!! AND I would think it would be frustrating to do such a beautiful job for a fake wedding scene...WOW....but I guess the creative aspects of it must still bring you joy. Wow gorgeous photos looks like hard work. It's my first tablescape it was hard just doing that! I can't imagine the work that goes into such a thing on a daily basis, but so rewarding I bet. What beautiful photos. Thanks for sharing and have a wonderful day! 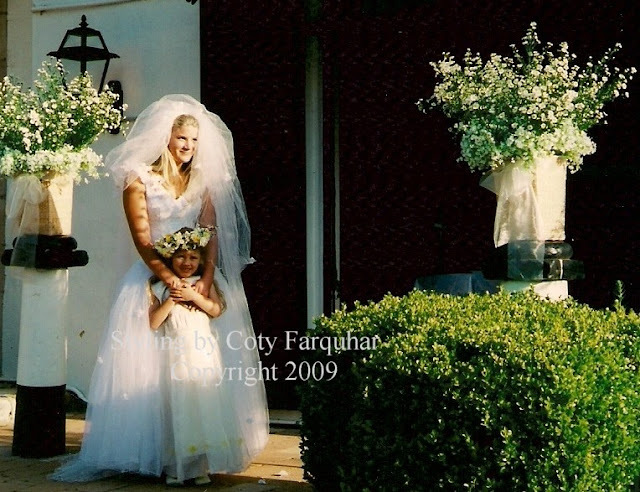 Coty, your photos are beautiful, as always. 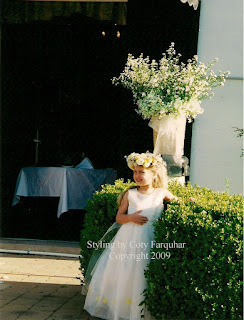 I hope when my daughters grow up, I can hire you to do their weddings! Can't wait to see what you have in store for next week! Oh my goodness, I need a nap after just READING this. Amazing, simply amazing. Everything is absolutely beautiful. Good morning Coty, I can see why this is more a lifestyle than a job; but a lot of work for beauty. I really enjoy this again. Thank you.Do you do this all in one day ? 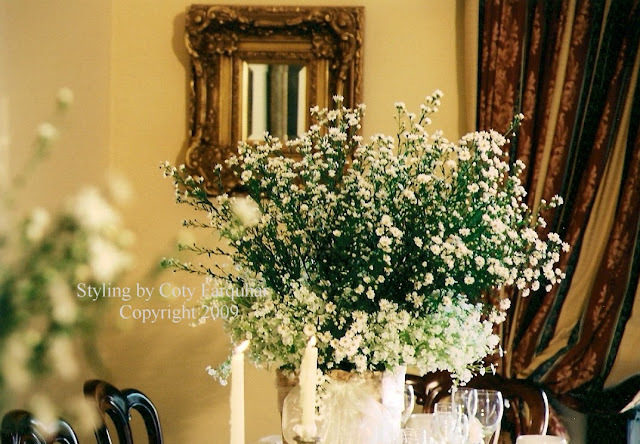 Very beautiful tablescapes. I will be back later to take it all in more carefully. it may be exhausting to you, but its totally exhilarating to my eyes~ i love all the details, your style is impeccable to me, i just adore looking it at your life. The setting is so incredibly beautiful! Your work is such an inspiration, thank you for sharing it. I come to your blog again and again, and it is just so enjoyable. Your love for your work really shines through! Breathtaking work, you do amazing work.I have to back to take a second look. You create such beautiful photos. That is a lot of work. I would have guessed that there was a huge crew in charge of the photo shoot. I never would have guessed that you were the florist, caterer, seamstress, etc. I must say all your efforts paid off in the results!! Stunning.. every picture!! 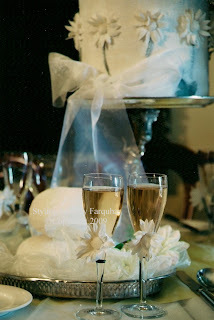 I'm sure most photographers are glad they do not have to orchestrate the room, the cake, the styling, the dress as well as the photos. You are amazing!!! There must be that added pleasure of knowing you have styled the results as well as having some choice in colour, but I can appreciate you must be exhausted and couldn't do this everyday. looks like a charming wedding! very classic indeed! It was really interesting to find out about all the "behind the scenes" hard work that you do...as usual, the end result is a joy to behold.